Explore the world around you...dream of exciting adventures...discover new places! 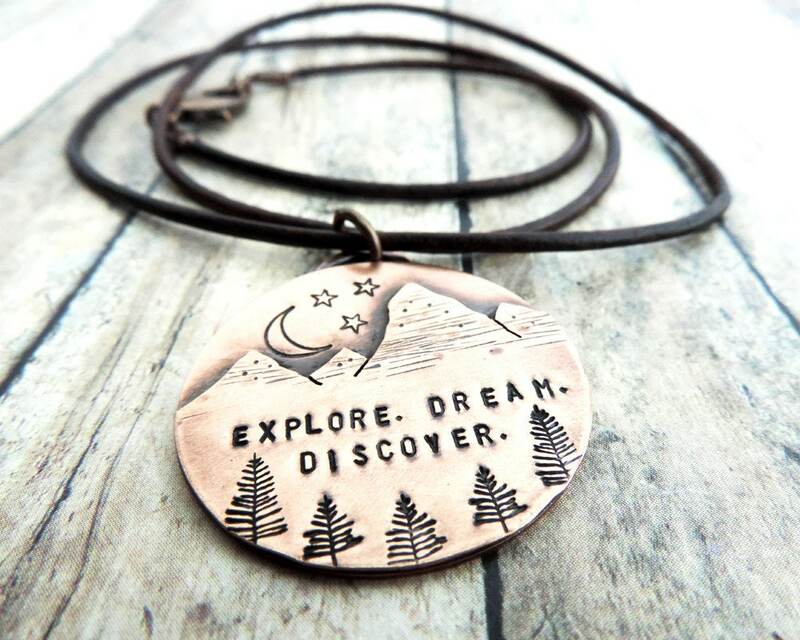 The mountain design is hand drawn and cut from copper sheet and soldered to a copper background. It is accented with pine trees, a crescent moon and a sprinkling of stars. My wife loves her new necklace and has worn it proudly nearly every day since I gave it to her for our anniversary. We both love the rustic craftsmanship and the love for all things wild it evokes. Gayle was a joy to, not just work with, but to get to know. She ensured that the necklace arrived in time and was so kind and encouraging in our conversation. Thank you, Gayle. I can't rave enough. Beautiful, shipped and arrived quickly, nicely packaged. Would definitely buy again from this shop.